Mission: With the mission of making remote-sensing data accessible, the Alaska Satellite Facility Distributed Active Archive Center (ASF DAAC) downlinks, processes, and distributes remote-sensing data to scientific users around the world. As one of 12 NASA DAACs, ASF specializes in synthetic aperture radar (the full acronym is ASF SAR DAAC). ASF is part of the Geophysical Institute of the University of Alaska Fairbanks. ASF’s data pool and the facility’s satellite-tracking ground station are central to research on polar processes, wetlands, glaciers, sea ice, climate change, permafrost, flooding, land-cover changes, earthquakes, and more. SAR bounces a signal off of the Earth’s surface to detect physical properties. Unlike optical sensor technology, radar can see through darkness, clouds and rain. Two or more SAR images can be used to measure the movement of ground and structures due to earthquakes, sinkholes, and other causes. Recent Research Highlight: In April 2015, relief efforts for the Nepal earthquake gained a new source of vital satellite information through the ASF SAR DAAC two days after the quake. 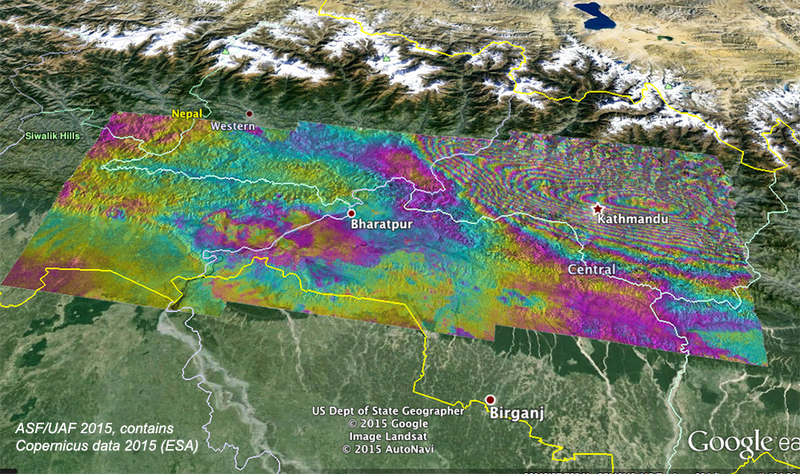 ASF accomplished a week’s worth of work in a matter of hours to make Nepal data and imagery available online. The data are from the European Space Agency’s Sentinel-1A satellite through an agreement reached between ESA and NASA immediately after the earthquake. The goal has been to make this critical data widely available. In one day, ASF identified radar scenes of interest for the region, transferred them to a storage environment, and made them available online in a virtualized infrastructure. The data were initially processed by ESA. ASF then completed the updating of its data portal Vertex so users can easily search and discover Nepal data from Sentinel-1A in a web-based graphical environment, and ASF developers also created a data feed for Sentinel-1A Nepal data. Researchers can use SAR to identify hazards such as loose slopes; predict which areas may be particularly vulnerable to aftershocks and future earthquakes; and understand causes of earthquakes. In the days following the earthquake, ASF scientists used Sentinel-1A data to create the interferometric image below. Figure 1: This Google Earth InSAR image was created from Sentinel-1A synthetic aperture radar (SAR) acquisitions on April 17 (before the earthquake) and April 29 (after the earthquake), capturing the co-seismic ground motion. Each colored fringe indicates about 8.5 cm of surface motion, with ground motion exceeding 1.4 m in areas north of Kathmandu. Regions with dense fringes mark the areas where most motion occurred. All data was processed using the GAMMA software.